With a mind-boggling 2.2 million apps in Apple’s iOS App Store, how do you find what’s good? That discovery problem is why we’re starting the 50 Essential iOS Apps series, a curated list of the best iOS apps on the planet, with new apps added every Monday, Wednesday, and Friday. Throughout this series, we will highlight essential iPhone and iPad apps in a variety of categories. We will show off apps that display excellent design, functionality, features and value. Or, most often, a combination of those desirable traits. Whether you’re looking to boost your productivity, take advantage of important data or just have a little fun, we’ll recommend great iOS apps to suit your needs. With each app in the series, we’ll explain what it does, the kind of user it’s for, and why it’s great. We won’t present apps in any particular order. Ultimately, the list will form a collection of 50 great iOS apps. Much like our essential Mac Apps series, we will not include software that comes preinstalled on an iPhone or iPad. 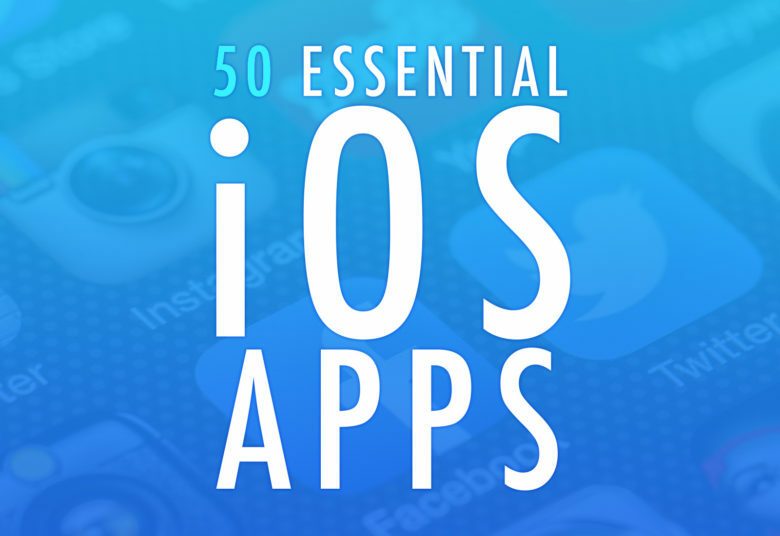 The 50 Essential iOS Apps series will help you expand your app collection by showcasing new and useful apps. We chose apps because they offer great value for your money. Or because they rank tops in their class or do something useful that no other application does. Sometimes, they will do all of the above. Basically, everything featured in our 50 Essential iOS Apps series will prove too good to miss. 1: Deliveries: Get the lowdown on all your deliveries, both ingoing and outgoing, with this superb package-tracking app. 2: Dark Sky Weather: Get a constantly updated “next hour” forecast, highlighting when precipitation will start or stop. 3: Hiya Caller ID and Blocker: Determine whether incoming calls are telemarketers, spam, or something worth picking up for. 4: Snapseed: This powerful all-around photo software eliminates the need for multiple photo-editing apps. 5: Drafts: Advanced features and a simple design make this a standout note-taking app. 6: Transit: Transit for iPhone makes finding train bus, and subway schedules simple, with support for more than 80 U.S. cities. 7. Purify: The internet can be a scary place. This simple application to make it a little less creepy and a lot more tolerable. 8: CheapCharts: Track price changes on iTunes and App Store content and save money. 9: Overcast: Get a great podcast listening experience along with some awesome time-saving features. 10. Encrypt.me: A trustworthy, easy to use, and affordable VPN service for iOS and beyond. 11. Astro Email: Enjoy email again with smart features, email actions, and a built-in assistant. 12. Coda for iOS: Edit code, manage a remote server, or upload files over FTP from your iOS device. 13. Workflow: Use automation and personalized actions to get things done quickly and efficiently on iPhone or iPad. 14. YouTube: If you’re not using the YouTube app to watch YouTube videos on your iOS Device, you’re missing out. 15. Dashlane: A secure and easy to use password manager for iOS, macOS, and beyond. 16. Kindle: Carry an entire library’s worth of books on your iPad or iPhone. 17. Tweetbot: Get a better Twitter experience with a nicer, easier-to-use, better Twitter client. 18. Obscura 2: Upgrade from the stock camera app and get powerful manual camera controls and a simple interface. 19. Narwhal: Get a better Reddit experience with intuitive gestures and a clean interface. 20. Instagram: Document your life, or explore your hobbies and interests through photos. 21. Google Photos: The best way to easily backup your photos and videos, and a more powerful search for specific images. 22. Waze: An easy to use navigation app that provides useful insights that other turn-by-turn apps lack. 23. Nike+ Run Club: The Running app that keeps you moving, from your first run to your thousandth mile, and beyond. 24. GoodNotes 4: The best digital note-taking and document-annotation apps available on iOS. 25. Streaks: Turn your recurring tasks into lasting habits through gamification. 26. Alto’s Adventure: A fun, delightful, and perfectly addictive iOS game. 27. iA Writer: The perfect writing app that does more more by doing less. 28. Nuzzel: Get a summary of the news stories everyone is talking about online, personalized to you. 29. Movies Anywhere: Sync your digital movies between iTunes, Google, and Amazonand have your movies where you want them. 30. Fantastical: The customizable, flexible, and incredibly simple-to-use calendar app for managing a chaotic schedules. 31. Paprika: The recipe manager, grocery list, and meal planning application for chefs of all skill levels. 32. CARROT Weather: A weather app with a hilarious personality and a best-in-class Apple Watch app. 33. TickTick: A top-notch upgrade to your reminders and to-do list for iOS and Mac. 34. Cash (Square Cash): Split a check, pay a friend back, and save $1 on your morning coffee without carrying a stack of bills. 35. Pillow: Get a clearer picture of how restful (or restless) your sleep is to improve your overall health. 36. Gas Buddy: Find nearby gas stations to save money and reduce stress on road trips and family vacations. 37. GIFWrapped: Find the perfect GIF, save it to a personal collection, and share your favorites quickly and easily. 38. ParkWhiz: The best parking app to find a lot and reserve a spot and travel easier. 39. Spotify: A better way to experience your favorite songs and discover great new music, thanks to algorithmic intelligence and some genius features. 41. Hours: The time tracking app, designed to help you log and understand where your time is being spent. 42. Documents: The best way to take file management on iOS to the next level. 43. Annotable: Add pro-level annotation and markup tools to highlight or hide whatever you want in an image. 44. Clue: Track physical and mental metrics to better understand your period and reproductive health. 45. Slack: The messaging app for teams turns your communications into what they are meant to be — conversation. 46. Cesium: The alternative music app for accessing and listening to your personal iTunes music library on iOS. 47. Paper: Go from analog to digital and express your artistry without the cost and space constraints of an art studio. 49. Pocket: Save articles and news stories for later and catch up on what you want to read, on your schedule. 50. Highball: The secret weapon for crafting the perfect, elegant cocktail for any occasion. Check back every Monday, Wednesday and Friday for more of the best iOS apps.